Vinmetrica provides kits and supplies to measure SO2, Malic, Sugar, pH, Alcohol and lab services for analysis of Brett, Brix, Color and almost any other fermentation indicator that can be measured. Now offering FREE DOMESTIC GROUND SHIPPING on orders over $49! A single kit includes everything you need to start measuring. Get tests results for SO2, Malic, pH & TA with ease. Dependable and precise results take out all the guesswork. Many of our tests are only $1 per test or less. We offer classes and publish content on the art and science of making fine wine. The SO2 device is worth its weight in gold. The Vinmetrica SC-100 allows me to accurately test 6 or 8 wines for Free SO2 in less than an hour including setup time vs spending an entire afternoon testing wines using the AO method. The test results correlate within a few ppm of results from commercial test labs. Anyone getting into home winemaking should seriously consider the SC-100 as one of their key investments. I bought the SC 300 with the pro tower and Burette. Essentially, I created my own small lab right in my barrel room. This has proven to be one of the most effective investments I’ve made here at Bodegas Cieli. Instead of waiting and wondering about the next lab analysis, I schedule lab work each month when we top barrels. We don’t test one or two barrels, we test all my barrels. The process is straight forward, high school chemistry lab, with a very simple mathematical conversion that is explained with the equipment manual. I’ve cross checked my results now with a professional lab in Paso Robles and find my own analysis for Free SO2 - pH - TA - Total SO2 to consistently be within very tiny variance to their lab analysis of my same samples. The tests are easy to perform and repeatable with a high degree of accuracy. One of the best investments I’ve made for initiating maceration and fermentation and ultimately for preserving and protecting my barrel aging wine. I highly recommend this product to anyone in our industry or even the first time winemaker at home. Great product! Oxygen management in winemaking is as – if not more – important than managing SO2 levels in making truly great wines. 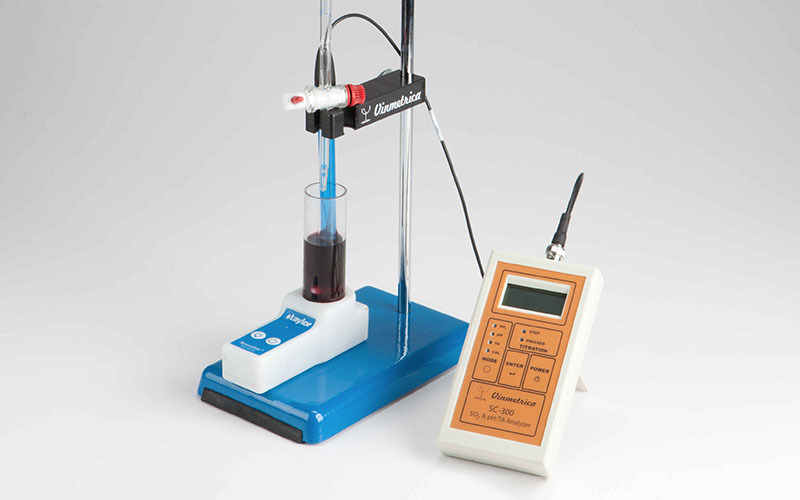 And now, Vinmetrica has made it possible and affordable for home winemakers to easily measure dissolved oxygen (DO) levels in wine using a galvanic-type electrode that connects to an SC-200 or SC-300 analyzer. The electrode performed very well compared to instruments that cost even one order of magnitude more. The SC-300 analyzer and DO probe are now my go-to instruments for monitoring DO levels in my wines. This is a great product! I needed to get a full analysis of my wine prior to bottling so I ran tests with the SC300 3 days before a commercial lab. Two wines analyzed. Don’t know about you, but this is certainly close enough for me and this is food product we are measuring, NOT a pharmaceutical. One more thing, I am not a big believer in expiration dates on drugs or reagents. I think if stored well, they last way longer than professed. My tests were done with Vinmetrica reagents that are 7-8 months old. They say they are only good for 6 months. I disagree. Store them well in a cool environment and I think they last easily twice as long.